I arrived home late from work yesterday to find the most wonderful site in my living room. My order from David Austin Roses has finally arrived! I have 12 roses in this lovely box and I cant wait to share them with you. I couldn’t get them up and running yet because of work and I didn’t want to leave them soaking for more than 24 hours so I simply took a peek inside and wrapped them back up again. They looked moist and very healthy. Tonight I will be soaking them over night in a solution of water, hydrogen peroxide and Super Thrive and they will be potted up on Saturday morning. I cant wait until they bloom. Click on the individual photo for a better view. Belle Story: This is actually a replacement for the one I ordered last year. I ended up trying to plant it in the ground, but after dismal results, I moved it into a pot and it didn’t survive the move. I did however get a couple of small flushes from it and completely fell in love with this rose. Its not as disease resistant as I would like, but I think with better care it will do well in the garden with occasional spraying. I plan on putting it in a very large pot in a prime location because I adore this rose. Lady Emma Hamilton: I saw this rose in person at the Golden Gate Park rose garden in San Francisco a few years ago when I went up for my sister-in-law’s wedding and it was love at first sight. I can’t remember ever being so smitten by a rose. I have wanted it ever since, but have hesitated, since its listed as being recommended only to zone 9. I have however had luck with other roses for ‘zone 9’ and am willing to give it a little extra care if only it will bloom for me. Here’s to the tenacious gardener! Lady Of Shalott – Own Root: I was told by a few other Florida rose growers that this particular rose does well in South Florida, even though it is not listed as one of the roses recommended for the state. I will however be growing it in a large pot as opposed to the ground and will be hoping for the best. Molineux: This one is also a replacement rose as my poor Molineux never quite took off last year for some odd reason. It did leaf out, however never quite grew good feeder roots which is what I think may have lead to its demise. We had a particularly warm winter last year and I think that may have contributed to some of them not getting off to a good start. Olivia Rose Austin: This one has gotten a lot of media attention for its bloom power, vigor and, most importantly, its disease resistance. David Austin actually claims that this may be the best rose he has ever put out. With a statement like that, I had to try it. If its anything like Boscobel, I’m sure I will be pleased. 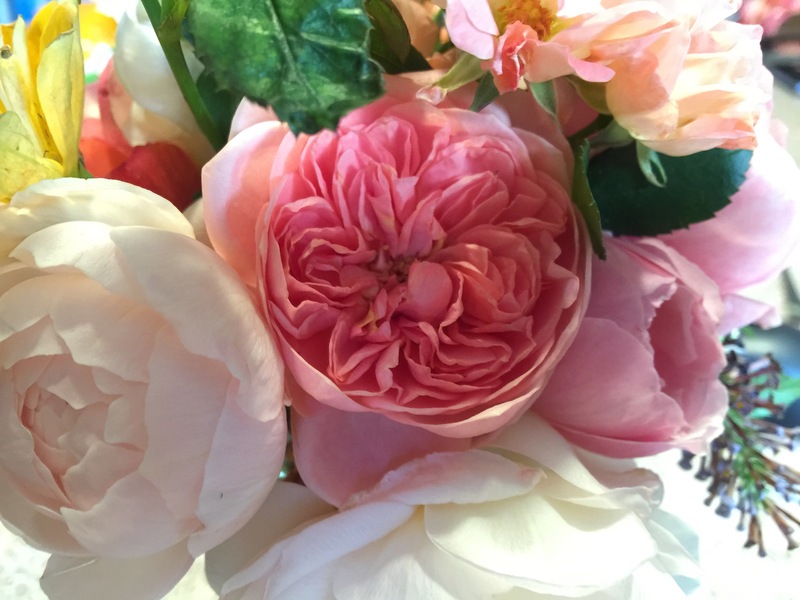 Sharifa Asma: I added this rose to my order at the last minute after having been on the fence for a while about it. I am very fond of pink roses, but admittedly already own many. After I was told by some other Florida growers of her amazing scent however, I decided to give it a try. I look forward to those first blooms. St. Swithun: This is another attempt at finding that perfect pale pink rose. I was St. Swithun might be the one that works for what I am looking for, so I decided to give it a try.This one, along with The Wedgewood Rose are both going to be planted on either side of a gazebo arbor that I recently set up and will be grown as climbers. The Alnwick Rose – Own Root: I once had this rose many years ago and it died due to neglect during my first pregnancy. I had terrible morning sickenss throughout most of my pregnancy and had very little energy left to care for my roses. I lost many good ones due to neglect. And when I say neglect, I mean I didn’t even water them. Alnwick seems like it would have done well with better care so I’m giving it a second chance, this time on its own roots. Its mentioned on the list of Austins recommended for Florida. I’m very fond of the cup shape and the hue of this rose and hope it does well this time around. The Endeavour: I am extremely excited about this rose. Its touted as being very compact in growth and is said to do well in warmer climates. Its not on the list of recommendations for Florida, but I’m willing to give it a try regardless as there are other Austins I have grown that do wonderfully for me and are not on the list. The Wedgwood Rose – Own Root: I have been looking for a good, pale pink rose from David Austin ever since I discovered him back in 2010. I have tried many pinks, but somehow have not been able to find the full, quartered pale pink rose I’ve dreamed of. Of the ones that I have grown, many either faded to cream, or were deeper in color then what I have been looking for. I am hoping The Wedgwood Rose will be the one I have been searching for. Windermere – Own Root: I am attempting to try out some of the Austins as own roots seeing as Dr. Huey is short lived and has not fared too well in my garden. I currently grow Claire Austin on her own roots and she’s done wonderfully, so I grabbed a few on their own roots this year (including Darcey Bussell, Golden Celebration, Strawberry Hill and Carding Mill which I got from Chamblee’s Nursery a few weeks ago). I ordered Windermere because I’m looking for a nice old fashioned white rose as my Claire Austin’s blooms are butter yellow in the South Florida heat. Windermere is one of the roses recommended for Florida by David Austin. As you can see, I am extremely excited for my roses that have finally arrived and I will be keeping you updated with how they, and all my other roses, continue to perform in my South Florida garden. Heirloom Rose: A truly beautiful hybrid tea rose with sumptuous purple tones tinged with mauve. The cooler temps have really brought out its best color and I just had to share this perfect bloom. Heirloom requires a bit extra care during the humid months, as it is susceptible to black spot. But the deep purple blooms are worth the extra effort especially with its unique color. Enjoy! The varieties in the left side vase are Jubilee Celebration (deep pink), Souvenir De Baden Baden (ivory) and Heritage. On the right hand side you see Sheila’s Perfume (pink blend), Gemini (light pink) and Livin’ Easy (orange). These were topped off with delphiniums from the garden as well as a few sprigs of Ageratum which was grown from seed. Some of the petunias I started from seed began blooming today. Here you will see some standard purple petunias, a few double petunias (Double Cascade Mix from Park Seed Co.) and a Lavender Tie-dye series. Two new delphinium plants that I recently added to the garden and a new variety of Angelonia which has very large flowers called Angle Face by Proven Winners. Click through the gallery for more info on each plant. You can’t grow roses in Florida! This is a statement I have heard on more than one occasion and I’d like to reply with 6 little words: My rose garden begs to differ. Growing roses in Florida, especially South Florida isn’t easy, it’s not for the faint of heart or the lazy landscaper who wants to plant it and forget it. But it can in-fact be done and it has been done for many years even in Miami, even in homestead and I would bet even in the Florida Keys. I began gardening when I bought my first home in 2010. Until then I always liked houseplants and flowers of all kinds, but I had no yard. Living in apartments most of my young adult life made it difficult to grow more than the occasional African Violet by the kitchen window. But even when I got my first, very own apartment in South Beach, I made a little bed of flowers in my entrance way and had a little row of annuals by my back door. I suppose I get it from my grandmother who loved roses and grew all sorts of flowering plants in Puerto Rico where I spent every summer growing up. She had everything from key limes to guavas and orchids to tropical plants and even the infrequent rose. Within a month of owning my home, my mother came over to help me create a flowerbed and liven up the back yard area around the pool. We had a great time chitchatting and digging up the dirt. That’s when I was truly bitten by the gardening bug. Soon I was hitting the gardening centers almost every Saturday morning, looking for new and exciting flowers to add to my garden. Most plants didn’t last long for me, but that didn’t seem to bother me. I just replaced the old with the new and kept the garden fresh and teaming with color as much as I could. But, I still had a lot to learn. South Florida, unlike most of the country, has its own unique climate. We have no frost or snow. No winter dying and emergence of spring to rejuvenate the garden. Things must either grow year round here or perish after a few months depending on the species and the season. When flowers I was very fond of died only a couple of months after planting, I began reading and researching everything I could get my hands on in order to create the garden of my dreams. To my dismay I found it hard to find information on my very specific and quite unique environment. Gardening seemed to be going out of style. A hobby for little old ladies that was dying out and not being passed on to the next generation. My neighbors mostly had boring landscaping with palms and other perennial plants that didn’t do much more than just sit there year after year. I wanted color, I wanted flowers, I wanted roses! I quickly grew tired of the same old annuals and perennials at the garden centers. These were the same tried and true plants that I had seen all around me growing up in South Florida. I wanted a garden full of extraordinary beauty. Something you don’t see everyday driving passed your local shopping center and I vowed to do it. When I came across a website that sold roses online my true passion was ignited. I had no limitations now, nothing to stop me from growing the roses that I so badly wanted. To this day, my garden is an ever-evolving plethora of blooms, color and variety. But with that comes the many challenges that face our region. Disease, insects, intense heat and humidity, nematodes and every creepy crawly plant-eating creature known to man, affect us. It hasn’t been easy. But nothing that’s easy is ever worth doing. I push forward because nothing is more rewarding than seeing the garden thrive and the roses bloom. It is my pleasure to introduce to you South Florida Rose. This blog is about getting more people into the garden. It’s about helping people become more involved with their environment and hopefully passing on the skills to a younger generation. There is no hobby as rewarding and growing your own flowers or fruits and vegetables and it’s a skill we should all have. The bees and butterflies depend on us! Welcome to South Florida Rose! A place to learn, try and err and most importantly…a place to grow!